In this section we will look at how input devices can be used to get data into a computer system. In section 2.1 we will focus on manual input devices and then move onto direct input devices in section 2.2. For each input device you have to be able to identify it from an image, explain what it is used for and discuss advantages/disadvantages. Know the purpose of and be able to identify different manual input devices. Understand the uses of each manual input device. Be able to discuss advantages and disadvantages of each manual input device. "Hardware devices that allow data to be entered into a computer." A keyboards is another example of a commonly used input device. More examples will be shown further down this page. Storage Devices - holds the data in the system. This diagram shows where input devices fit into a computer system. Manual input devices require humans to do most of the work needed to get data into the system. If you are using a keyboard to input instructions into the computer, you have press the keys yourself. It is a manual job not automatic. The first five lettered keys of a keyboard spell out QWERTY. Ergonomic Keyboards have a natural shape and built-in hand-rest. 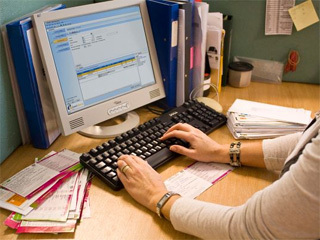 Inputting data into a computer using a keyboard. Command Line operating systems require a keyboard in order to be able to use the computer at all! 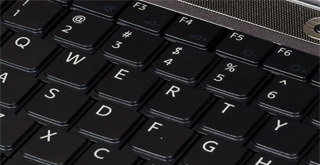 Keyboards are one of the most commonly used manual input devices. Most keyboards use a QWERTY key layout. The name 'QWERTY' comes from the first five lettered keys on on the top row of the keyboard - Q-W-E-R-T-Y. Special keyboards called 'Ergonomic Keyboards' have been developed to help reduce health problems (such as repetitive strain injury)linked with typing. Ergonomic keyboards have a more natural shape to them with reduces stress on the wrist and hands. Ergonomic keyboards also come with a built-in hand-rest which further helps prevent health issues such as RSI (Repetitive Strain Injury). Keyboards are used to input data into applications. Keyboards can also be used to enter commands into the computer. Enables fast entry of text into documents. People with wrist and hand problems can find keyboards painful to use. Very easy to use (you just press the keys). Keyboards are quite large and can take up a lot of desk space. Information that you input instantly appears on the screen. This lets you quickly check that what you are entering is correct. Entering data is slow when compared to automatic methods. For example - a barcode code scanner will input data into the computer almost instantly. 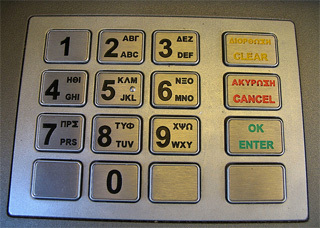 Bank ATM's use numeric keypads to let us enter PIN numbers and withdrawal amounts. 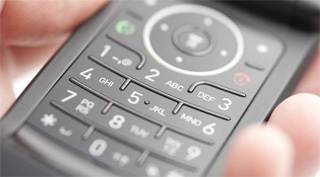 Mobile phones use numeric keypads to allow us to enter phone numbers. Some numeric keypads also allow you to enter simple text and symbols. Entering personal identification numbers (PIN) into an ATM to allow us to access our cash. Keying in how much money you would like to withdraw from an ATM. These use numeric keypads to allow us to enter phone numbers. 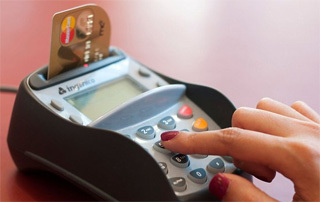 These have numeric keypads to allow users to enter PIN numbers and payment amounts when we buy goods and products. Faster than QWERTY keyboards when used for entering numbers. People with large hands can find them hard to use because of their small keys. Numeric keypads are small so they can easily fit on smaller devices like mobile phones. Difficult (but not impossible) to enter text information. Mice are one of the devices that allow us to control a screen pointer. Trackerballs also allow us to control a screen pointer. Pointing devices are pieces of hardware that are used to control a pointer (curser) on a screen. Pointing devices are frequently used with Graphical User Interface (GUI) operating systems where pointers are used to input commands by selecting icons. Pointing devices (like mice) are used to control pointers (curser's) and click icons and options on GUI operating systems. There are two different types of mice - a ball mouse and an optical mouse. A ball mouse uses a ball to detect movement. These are prone to clogging which can affect accuracy. 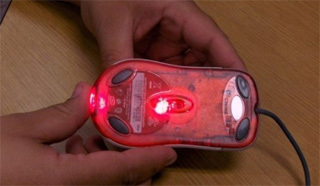 An optical mouse uses light to detect movement. These are more accurate than ball mice and are better for editing images. Cordless mice are used in exactly the same way as regular mice but they do not use a wire plugged into the computer. They use wireless technology in order to communicate with the computer. They are powered by batteries. Uses a ball under the mouse to detect movement. Uses reflected light to detect movement. The ball (in a ball mouse) and the reflected light (in an optical mouse) allows the user to direct and control an on-screen pointer. Scroll wheel is used to move up and down through a document. Mice use two buttons and a scroll wheel to allow us to activate different functions. Cordless mice work in the same way as regular mice but they do not need a wire plugged into the computer. They are powered by batteries instead of the computer. Cordless mice are an example of a wireless device. Opening, closing, maximising and minimising programs and files. Moving, grouping and deleting files. Controlling a pointer on screen to select icons or move around the page. Editing images in terms of size and position on the screen. Faster to select icons and options when compared to a keyboard. People with wrist and hand problems (like RSI) can find mice painful to use. Very easy to move a pointer around a screen and to navigate through documents. Ball mice can pick up dirt which will affect the accuracy of pointer movement. Mice are small and do not take up much space. For example - they would be difficult to use on train unless you had a flat table to rest on. Touchpads are built into laptops and perform the same functions as mice. The touchpad allows us to control a screen pointer and the buttons allow us to select icons and call up options. Used as a replacement to a mouse in many laptops. Users lightly brush their finger over the touchpad in order to control a pointer. Used to select icons and activate options. Used to call up a drop-down list of menu options. Easier than QWERTY keyboards when used to select options and icons. More difficult to control a mouse pointer when compared to a mouse. Touchpads are built into laptops so there is no need for a separate mouse. This helps improve portability. People with wrist and hand problems (like RSI) can find touchpads painful to use. Can be used even when there is no flat surface available. Some operations are more difficult to perform when compared to a mouse. Drag and Drop for example. Won't get clogged with dirt (as can happen with ball mice) so performance is never reduced. Trackerball's perform the same functions as a mouse but they require less wrist movement and so are more comfortable to use. Old arcade games machines often used trackerball's to allow gamers to direct in-game characters. 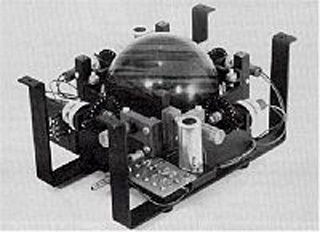 The world's first trackerball was developed in 1952 and used a bowling ball. Trackerball's are similar to mice but the ball is on the top of the device instead of the bottom. Screen pointers are controlled by rotating the large ball with your hand. The buttons on trackerball's perform the same functions as those on mice and touchpads. They are, however, much more comfortable to use than mice. This means that people with painful hand and wrist problems (like RSI) can use a trackerball. Why are they more comfortable? Trackerball's are more comfortable than mice because there is less wrist movement required. They are more ergonomic. Some arcade gaming machines use trackerball's to control games characters on screen. Because trackerball's are so durable (tough) they can deal with the wear and tear of gamers using them. More accurate than mice or touchpads. Pointer can be positioned more exactly which makes trackerball's very using for image editing. More difficult to learn to use than a mouse. No limit on ball travel. A mouse sometimes runs out of room on a mouse mat. With a trackerball you just keep rolling. control the channel, volume and many more. A man using a remote control to operate a crane. Remote controls are used to control other devices using infra-red signals. Some overhead projectors (like ours in the classroom). Operating robot arms in hazardous chemical plants. Devices can be operated without having to go to them. This is useful for people with disabilities. People with limited hand movement can find them difficult to use. 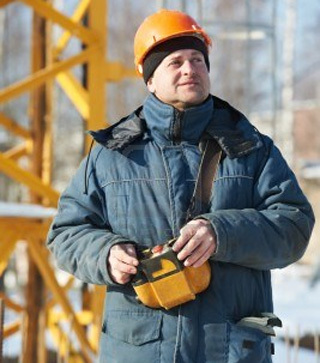 They can operate devices that are in an unsafe environment. For example: Explosives to demolish a building can be set off at a safe distance. The infra-red signal between the remote control and the device it operates can become blocked. 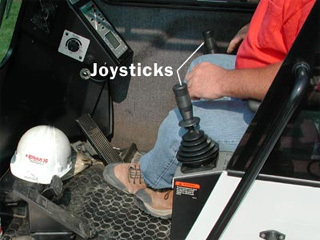 Joysticks used to operate a crane. Joysticks are also used to mimic real-life flight conditions on flight simulators. Joysticks have similar functions to that of mice and trackerballs...... to control a pointer on a screen. Allows us to move a pointer in the direction we want. Allow us to select options or 'click stuff'. 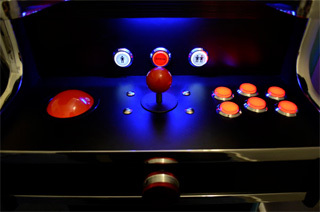 Joysticks are also popular devices for gaming. The handle allows gamers to control on-screen characters and the buttons are used for things like firing weapons. They can control characters or objects in video games. They are used in simulators. For example flight simulators use joysticks in order for trainee pilots to control the simulated plane. Easier to control an on-screen curser or move an in-game character than it is when using a keyboard. Not as easy to control an on-screen curser when compared to using a mouse. Very simple to get used to. Anyone can just pick one up and use it! People with hand/wrist issues (like RSI) can find them painful to use. Can be used by disabled people. 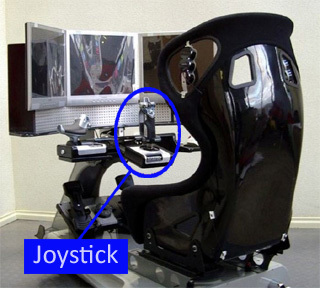 Joysticks can be operated by hands or even feet. Difficult (but not impossible) to enter text. For example: some games allow you to select individual letters using the joystick in order to spell out your name when entering a high score. A touch screen with 'pressable' options. reduce the size of the device. 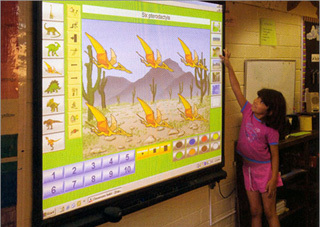 School classrooms use special touch screens called 'Interactive Whiteboards'. 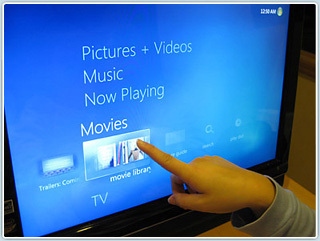 Touch screens allow users to input commands into a computer by pressing or touching buttons/icons on the screen. Giving users this ability to touch or press icons on the screen removes the need to use a mouse. Touch screens are more suitable for use with a limited amount of options. 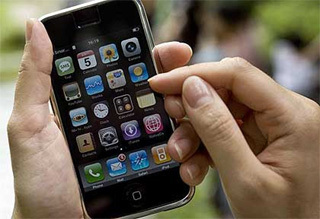 Mobile phones and PDA's use touch screens as a way of saving space (a separate keyboard would make the devices quite large). Public information systems at airports or tourist information offices. On-screen multiple choice tests (like driving theory tests) sometimes use touch screens. Very fast and easy to enter options (you just press them). Limited number of options available on the screen. No training needed in order for people to be able to use them. All people do is press the correct option. Expensive compared to other input devices. Screen can become dirty and full of germs due to people touching it. 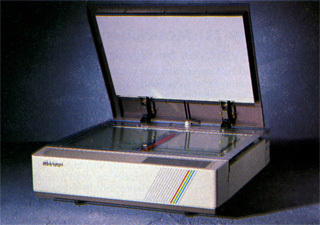 Earlier scanners, like the Sharp JX-450, could only scan documents in low-resolution (image quality lost). Modern scanners are capable of scanning documents and images in much higher resolution. This means that digital copies are closer to the original quality. 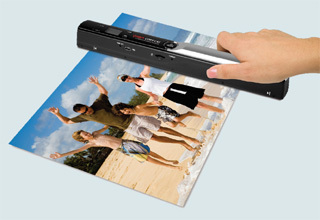 Some scanners are 'hand held' which means the user physically moves the scanner across the image in order to send a copy to a computer. Scanners are used to enter information on paper (hard copies) into a computer. Scanners can convert hard copies (printed documents, photographs etc) into digital data. This digital data can then be stored and manipulated on your computer. Scanners reflect light off the hard copy in order to capture an analogue image of the document. The scanner then converts the received analogue data into a digital format. Once the hard copy has been converted to digital data, it can be stored on a computer and manipulated using Graphics Editing Software (such as Photoshop). Old photos and important documents (like birth certificates) can be scanned into the computer. This means you still have a copy if the original is damaged or lost. Scanners are used to convert analogue hard copies of documents and photos in digital data. Very fast to enter hard copies into the computer (compared to retyping with a keyboard). Scanned images are usually of lesser quality than the original document. Very easy to scan and store documents and images into the computer. Digital copies of the stored data can easily be duplicated and backed up. Scanned images can take up a lot of disk space (especially if you scan them at a high resolution). Old photo's that may be damaged can be scanned into the computer then repaired using Graphics Editing Software. A graphics tablet with a stylus pen . Graphics tablets can be used to accurately 'draw' illustrations, symbols and diagrams. 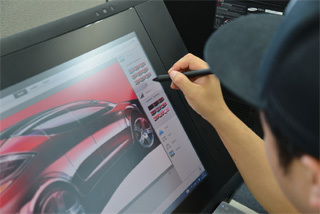 A high-end illustration of a car produced using a graphic tablet. Graphics tablets are used by artists and designers to easily create and store digital graphics in a computer. A graphics tablet can be drawn on with a special pen called a 'stylus'. 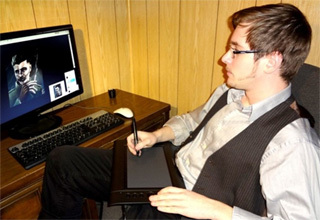 Whatever is drawn onto the tablet can be seen on a computer screen. It is really just the same as drawing on paper but the final image is digital. Anything drawn onto the tablet can be saved into the computer as images. Once images are saved into the computer, they can be edited using graphics editing software. Allow designers to produce digital images much more accurately than if they were using a mouse. Much easier to draw images using a pen than it is to draw them using a mouse. Very expensive when compared to a mouse. Very accurate drawings can be produced. Stylus pens make it better for the artist to capture fine detail than they could using a mouse. Not useful for some input needs. For example - graphics tablets are not designed for entering data into the computer by clicking icons or menus. Useful in countries where drawings and symbols are used instead of text (like China and Japan). Light pens can replace mice and touch screen for selecting items on a CRT screen. 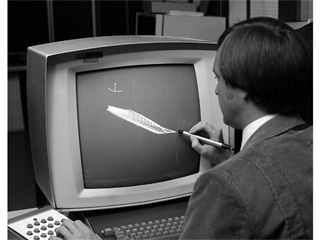 Light pens can be used to produce drawings directly on a CRT screen. Light pens only currently work with CRT Screens (the fat ones) . Light pens are quite old technology and can be used as alternatives to mice, touch screens or graphics tablets. 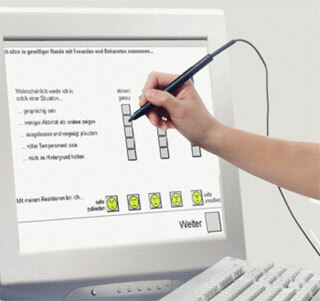 Light pens are used by directly drawing or selecting icons on a computer screen. Note: Currently light pens can currently only be used with CRT (cathode ray tube) monitors. They work by picking up light from the computer screen and then signaling to the computer exactly where the light was picked up. This allows the computer to 'draw' on the part of the screen where the pen picked up the light. Used for selecting objects on a CRT screen. For example: replacing a mouse or touch screen clicking/touching icons. Used for directly drawing onto a CRT screen. For example: replacing a graphics tablet to produce hand-drawn designs. More accurate than touch screens. Not as accurate as a graphics tablet when used for producing drawings. They are very small and so can be used where there is no room for a mouse or graphics tablet. 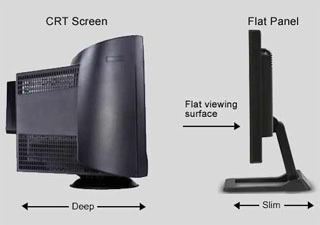 Can only be used with CRT (cathode ray tube) screens. Can be quite uncomfortable to use as you have to hold your hand raised up to the computer screen for long periods. Microphones are used to input sound into a computer. Microphones can be used to hold voice conversations over the Internet (like using Skype). 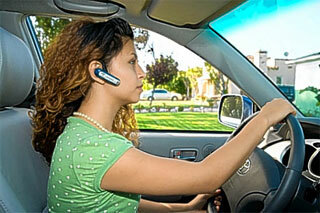 Microphones are used on hands-free mobile phone kits to make driving safer. Gamers use microphones to communicate instructions to each other in-game . 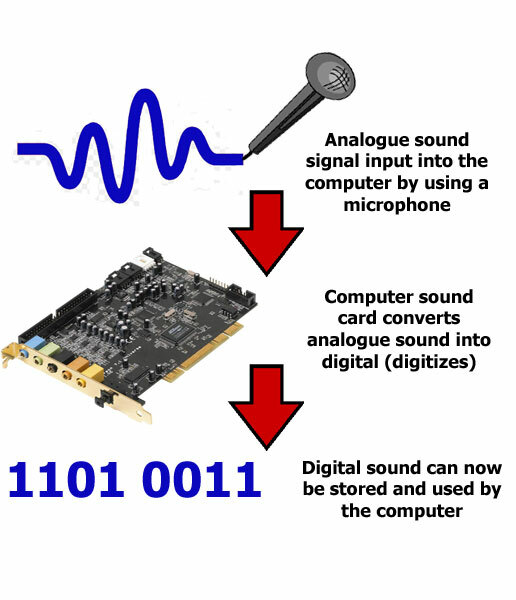 Microphones are used to input analogue sounds into a digital computer. (analogue signals that change slowly). Computers understand digital data and not analogue. For example: computers understand combinations of 0's and 1's. Note: the sound card acts as an ADC (analogue to digital converter). Once digitized, the sounds can be stored and used by the computer. Conducting videoconferencing (e.g. business meetings online). Issuing commands (e.g. some cars allow for speech to activate certain features like 'starting the engine' or 'altering radio volume'). Hands-Free mobile phones use a microphone to allow people to hold conversations without using their hands (this makes driving much safer). 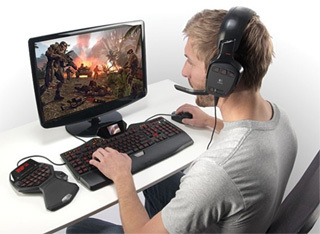 Used (along with headphones) in gaming so that gamers can talk to each other. Faster to read in text than to type it in using a keyboard . Sound files can take up a lot of computer storage space. Means that word processors can be used by people who cannot use their hands. Words are simply spoken into the software instead of typed. Speaking words into a word processor is not as accurate as typing. This means that mistakes are common with words that sound the same but have different meanings. For example: 'see' and 'sea'. Makes driving safer because people do not need to take their hands off the steering wheel in order to use their mobile phone. Background noise can interfere with voice recognition systems. Microphones are very cheap to buy. An old film-based camera . A modern digital camera with preview screen. Traditional photographs were stored on reels of film . 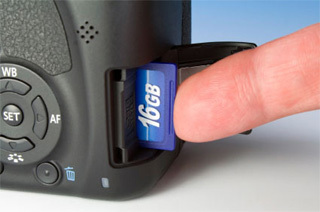 Digital photographs are stored on memory cards. Traditional photography was much more difficult to master. Much thought had to go into capturing quality photographs. Digital photographs are run-through software which does most of the hard work for us and makes it harder to produce bad images. Have pretty much replaced the old style film-based cameras. Digital cameras store digital photographs on a memory card and these images can easily be transferred onto a computer for viewing or editing. Most digital cameras have a built-in screen to allow for previewing the digital photograph. This is useful so that the photographer can decide which images to keep and which to delete. Digital camera image quality is measured in 'Megapixels'. These are the number of dots that make up the image. Generally speaking, the higher the Megapixels, the higher the detail quality of the image. 3 Megapixel cameras produce images made up of 3 Million pixels (dots). Most digital cameras can also capture video and sound as well as images. Almost all modern mobile phones have a built-in digital camera. Easy to transfer images to a computer for editing. 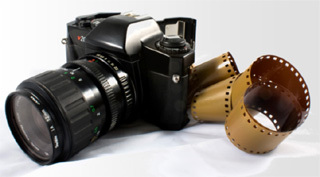 Most digital cameras also allow for short, high-quality video clips to be produced. No film to develop. This means that producing the photo is much quicker. Camera user needs to have computer skills to be able to transfer and print digital photographs. Unwanted images can easily be deleted from the memory card. 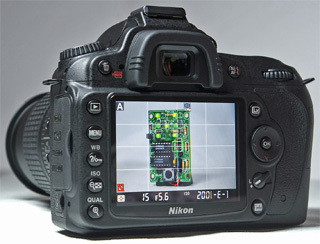 Not all digital cameras produce images as high-quality as traditional cameras. Because the images are digital it is easy to make copies of them. Artistry of traditional photography is being lost. Camera software can automatically correct 'bad images' making photography easier to master without as much skill. 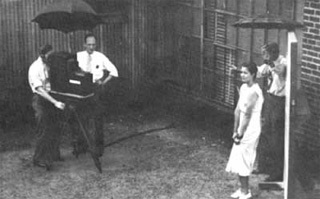 People using traditional 'film-cameras' had to take much more care to capture each image perfectly. No need to print at all because the images can be viewed a computer screen. This saves paper and is better for the environment. Memory cards can store thousands of digital photographs. 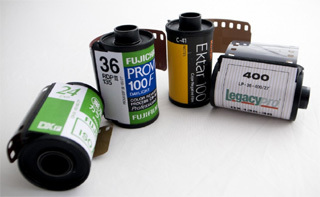 Traditional photographs can take up a lot of physical storage space. Digital images can easily be transferred using blutooth, email attachments and mobile phones. A web cam attached to a computer monitor. Web cams allow long distance face-to-face interviews to take place. 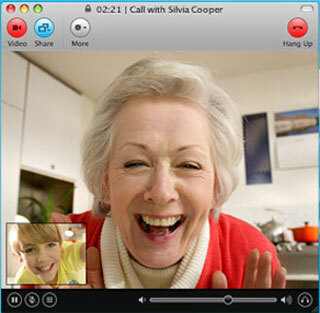 Web cams allow elderly people to hold face-to-face conversations with relatives. 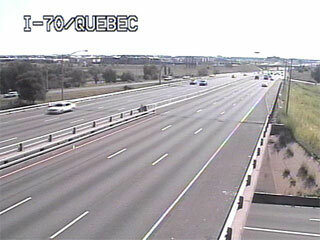 Traffic cams allow drivers to avoid heavy traffic. Web cameras are similar to digital cameras in their function but they are directly connected to a computer and do not have memory storage. Web cameras can capture both digital images and video. Images / video are sent directly to the computer where they can be stored and used. These digital images and video are often added to presentations, web sites and other publications. YouTube channels sometimes use web cams to capture the content of the channel. This is usually a presenter giving out information about whatever topic the channel is about. Many modern computing devices (such as laptops) come with built-in web cams. 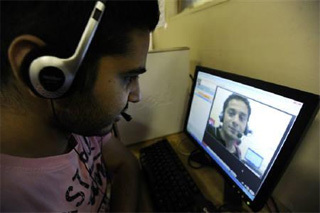 Used to conduct face-to-face conversations with friends and family online over VoIP applications such as Skype. A similar use is to conduct face-to-face job interviews over the Internet. This removes the need for job applicants to travel very large distances to attend the interview. Used to hold video-conferencing meetings over the Internet. Can capture image and video content for presentations, web sites and even YouTube content. Web Cameras are sometimes used by parents to keep an eye on their children when they are in another room. Some people use web cams as a cheap alternative to security cameras. Sometimes used to allow drivers to view the traffic conditions on roads. This allows the driver to plan a different route if the traffic on a road is too congested. Allow for long-distance face-to-face conversations. This removes the need for people to travel. The image/video quality can sometimes be poor (low resolution). 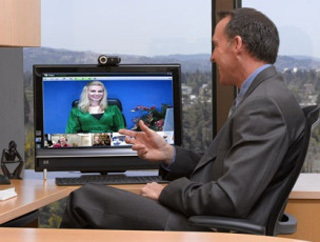 Video conference business meetings and job interviews can be conducted very cheaply over long distances. They do not have their own storage and so must be permanently fixed to the computing device. Parents can keep an eye on their children from a different location. Are usually in a fixed position and so cannot be easily moved around. Web cams can be left running constantly which makes them useful as security devices on properties.